Whisker Graphics: Using Twine and making sure it stays put! Quick video to share today. I came aross a tip that I knew would be helpful for those using twine in their scrapbook layouts and PL pages. Well, from now on, I've decided to label and refer my Project Life posts as "PL"... I've been hearing a buzz about how a certain company/brand is cracking down on the use of the PL phrase as it's copyrighted and trademarked. I have a lot to say but I'm just going to leave it at that. So I realized just now that I forgot to take a pic of the WHOLE spread of my PL layout. DOH! *lol* But you get the idea, right? This week I focused on using THESE printables from Whisker Graphics. I'm all about using little extra embellies, labels, and tags to jazz up anywhere that needs jazzing (say WHAT?). 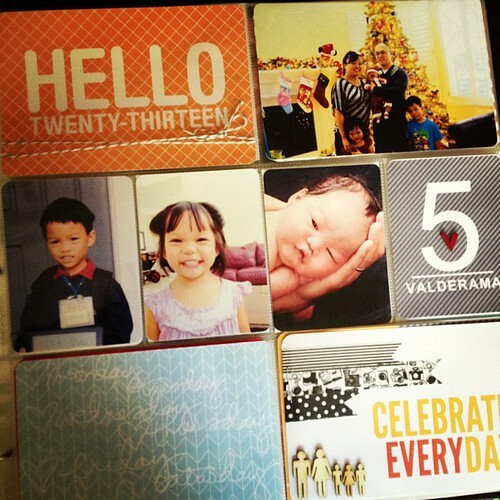 Seriously though, these little scallop circles add a cute and whimsical element to photos and journal cards. I especially liked using them to add extra journaling where I didn't have room otherwise. I consider myself to be a HUGE foodie - I love eating food, going to restaurants, trying new dishes, cooking in my kitchen, baking, etc. I often take pictures of the food I eat - whether it's from a restaurant or stuff I've made. I thought it would be neat to try and incorporate the actual recipes with the food I'm taking pictures of so WG's Large Tags and Bitty Bags were PERFECT! I just typed a quick recipe on my computer (it was easier than writing it out), glued it onto the tag, and slipped it in the bag. That way, who ever looks at our PL album 5 years, 10 years, 50 years from now can see what I've been making. BTW, the recipe I shared this week is actually something I made for the first time. We all loved it! Paper Issues + Project Life! Welcome to Paper Issues Becky Higgins Project Life! You should have arrived here from JEN'S BLOG! If this is your first stop, be sure to head over to Paper Issues to start at the beginning! So as you can tell from the title from the blog post, this week's issue over at Paper Issues is ALL about Becky Higgins' awesome concept called Project Life! (if you've never heard of it, you're missing out! Or maybe living under a rock. haha) You all KNOW I'm a huge fan (and as I type this I'm caught up to Week 26 - GO ME!). Anyway, now that you're done here, keep on hopping! Next up on the hop is MANDY! This week I focused on incoprorating Whisker Graphics' Bitty Bags into my PL layout for week 26. I've seen the Little Bitty Bags used in PL layouts before since they're a perfect size for the 3x4 pockets, but I hadn't seen the larger bags used until I came across a post on Instagram (so I can't take all the credit for this idea! *lol*). The larger bags are great for holding memorabilia that wouldn't normally fit in one of the PL pockets and they're also great for holding extra photos of events that you want to keep together, but don't necessarily want display! Thanks for stopping by! Have a wonderful rest of the week! I'm back with another Project Life layout using Whisker Graphics products. This time I'm focusing on TWINE! If you're anything like me, you've hoarded collected quite a bit of it in recent years. I've got a ton of twine - I use it especially for tying up favors for my family parties, greeting cards, scrapbook layouts, etc... and now twine is making its way into my Project Life layouts. When I'm feeling really ambitious, I like hand stitching with twine on my PL cards as you can see in the video below. Sure it takes a bit of time, but it's something that you can do when you're sitting on the couch watching TV - it's all about multi-tasking, right? Anyway, check out the video to see how I've used Whisker Graphics' twine on my PL layout this week! Thanks for watching and stopping by! New venture with Whisker Graphics + Project Life Week 16! I incorporated a little accent piece of Blue Solid Divine Twine on one of my journal cards - I really love how you can add twine to layouts (not just Project Life ones!) and it doesn't greate that much bulk. I also love different ways I can incorporate journaling - labels are my favorite! So I used a couple of Scrolly Square Labels (in Dark Pink and Aqua), and added them to my pic and journaling card. Thanks so much for stopping by today! I can't wait to share what I create with you all! After all that hemming and hawing over digital vs. traditional Project Life, I decided to go hybrid. There are some awesome printables out there (most of them free!) as well as awesome ones to buy. And I really do have a lot in my collection in my computer! It's a Canon Selphy CP900. I was on the fence about it for a while - we already have too many printers for one household (a b&w laser printer, a wide format printer, & an all-in-one printer. The all in one actually does it's job of printing great pictures, but it's in our bedroom and the hubby works nights. No scrapbooking/printing for me during the day!). So when I missed the great day after Christmas deal on this printer (it was going for $69 on Amazon! ), I had to get it when it was going for $75. And guess what? It's really awesome. Check out my new Project Life title page below. I changed it up a bit. But I'm REALLY loving the look of the page now. Loving the wood veneer potty people and yay for using my stash (I had been hoarding wood veneers like no one's business!). Ok, I'm going to do it. I've decided officially that I'm going to tackle Project Life and am going to conquer it in 2013. Who's with me??? What's even more surprising is that I am was planning to do this in digital form. What isn't surprising is that I changed my mind. Ugh. I hate being indecisive. Not a surprise. I had it all laid out. I had a plan to tackle PL in digital. I bought the Seafoam kit and templates and I even started! But then I looked at Susan Weinroth's blog post about Project Life and now I want to try to scrap traditionally. So for now, I'm still undecided. I might do PL in digital. I might do PL traditional. I might do both. For now, I think I'm just feeling my way through it and crossing my fingers that I stick to it this year. The good news is that I got my title page done! And I'm almost done with week 1. My plan is to work on Week 2 this weekend and be caught up. :) We shall see. The bad news is that I accidentally didn't save the left side of my Week 1 layout. Grr. Oh the joys of working with computers! Anyway, thanks for stopping by today! Hope you have a wonderful Sunday!